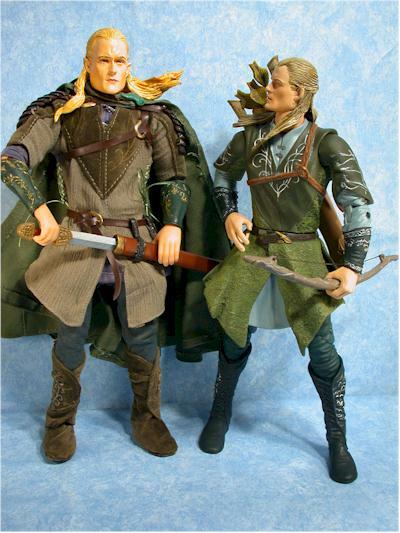 The Lord of the Rings license has no shortage of diversity - there's the regular 6" scale line, the sixth scale 12" figures, the small Armies of Middle Earth figures, and soon to come there's the new mini-mates. Throw one more scale and style into the pot - the 10" rotocast figures. Similar to the Hulk and X-men versions we saw earlier this year, these figures are just starting to hit stores. 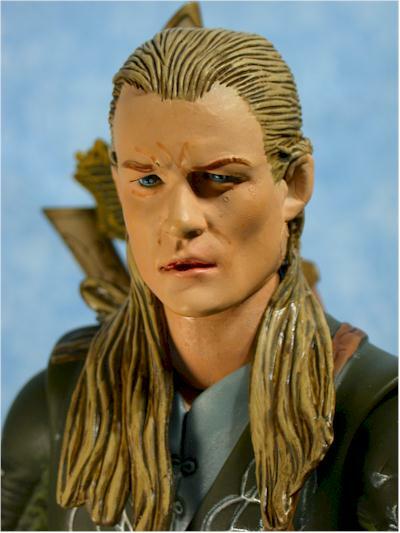 So far there is just Aragorn and Legolas, but I'm betting we'll see more if they do well. 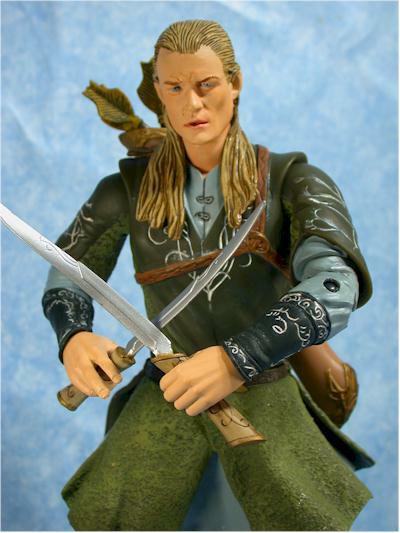 I picked up Legolas at a local Meijers for just $9, a great price. I'm betting we'll see these at Target and Toys R Us as well, and perhaps Wal-mart. A word about 'rotocast'. Normally, toys are cast in injection molds, which, as the name implies, are filled with plastic by injecting it into the mold under pressure. This fills the entire mold, and all the little details. There's another game in town, called rotocast molding (among other things). Instead of filling the mold, the mold is rotated (get it?) as the plastic is put in, and uses centrifugal force to coat the interior of the mold and fill in just the details. This leaves a hollow piece, and works great for large figures where solid plastic parts would be extremely expensive. The rotocast figures tend to be low price point figures, and it's reflected in the packaging. I'm quite surprised too, considering how easy it would be to steal the accessories in this open box. Still, if it keeps costs down on something this cool, I'm all for it. This sculpt, while not perfect, is a decided improvement over the regular sixth scale version. That version was too soft, without enough detail. If this one has any negative, it's that it has too much detail, with a little too rough of an appearance around the hair line and cheeks. Still, it's a world better than the previous 12" version, and the paint ops detract slightly from what is really an excellent version. Moving away from the head sculpt, you can see tons of detail in the rest of the figure as well. All of the clothing is sculpted, and the wrinkles and patterns give them impression of multiple layers and fabrics. The detail work on the quiver is particularly good, and I'm very impressed with the amount of effort that was put into a very inexpensive figure. The hands are a tad Famous Covers - oversized. The left holds the bow or sword fine, while the right is sculpted as though he's pulling back an arrow, or giving the peace sign, depending on your point of view. The paint ops aren't bad, but it's just shy of perfect. There's a little glopping around the face, and the hair line is a bit ragged. 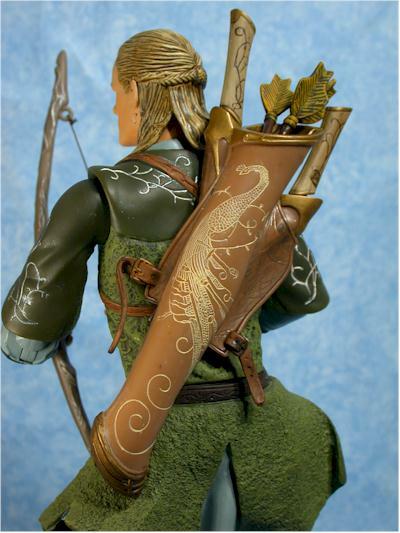 The detail work on the clothing and quiver is excellent though, and the colors are consistent and generally clean. There's a wide enough number of colors as well, and the face does not suffer from the God awful gloss finish that the 12" figure has. Wow! One of the difficulties with rotocast figures in the past has been handling joints, but they've cleared worked through that issue. 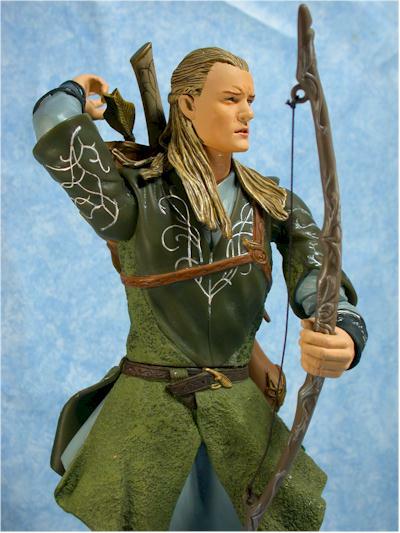 Legolas has a ton of articulation - ball jointed neck that works great, ball jointed shoulders, elbows (although the left is just a cut joint), wrists, waist, hips, thighs, double jointed knees, and boot tops. I think I have them all! That's great for any figure, but for a light weight, inexpensive figure like this it's pretty damn amazing. Some of the joints lack full range of motion, the hips were a bit restricted, and the knees were a little loose, but overall you can call me amazed. This version doesn't have quite as many accessories as his slightly taller counterpart, but it's close. He has his bow, three arrows, and two swords. 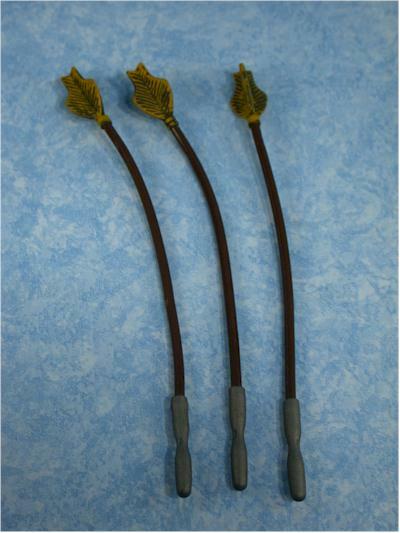 The arrows and swords fit nicely in the unique quiver, but they are made of very soft plastic. Clearly this is a toy, not a collectible, and as such the weapons are toned down a bit. The arrows have blunt tips, but you could always pretend they are the kind that you light on fire. They look just like it! 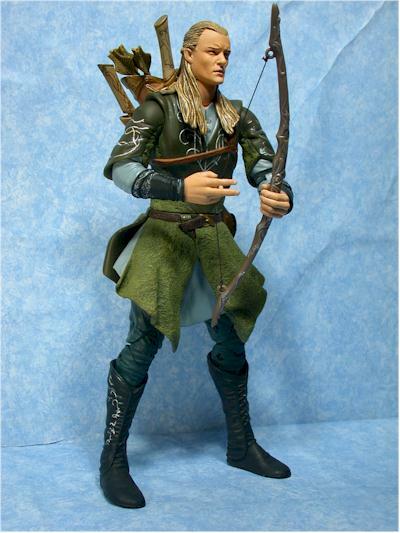 The swords and bow fit nicely in his hands, and overall the accessory number and quality is extremely good. Did I say nine bucks? That's less than I paid for either the Hulk or Nightcrawler! This is a fantastic value, and I'm hoping we see more figures in this style and price range. 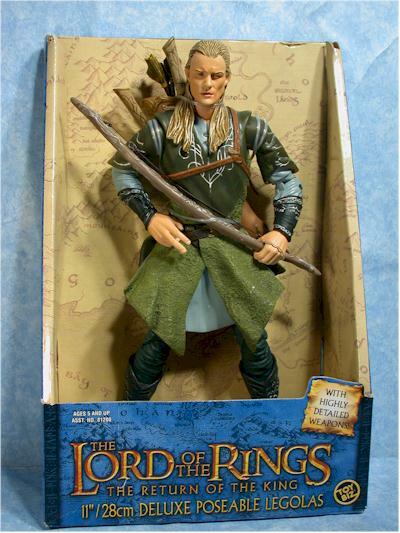 I didn't particularly like this figure - or the Aragorn - when I first saw them on the shelf. I prefer cloth outfits on figures this big, and they looked a little, well, silly. But you have to get these out to truly appreciate what a great toy they are. If I was a kid, I'd be in heaven with these. Tons of articulation, good sculpting and accessories - kids are sure to have a ton of fun playing with these. While only the value is really perfect, the overall score is effected by how great a toy this really is. I picked this up at Meijers. I'm assuming that Toys R Us, Target and Wal-mart will also carry them. KEEP SCROLLING DOWN FOR MORE PHOTOS, INCLUDING A COMPARISON WITH THE SIXTH SCALE VERSION!